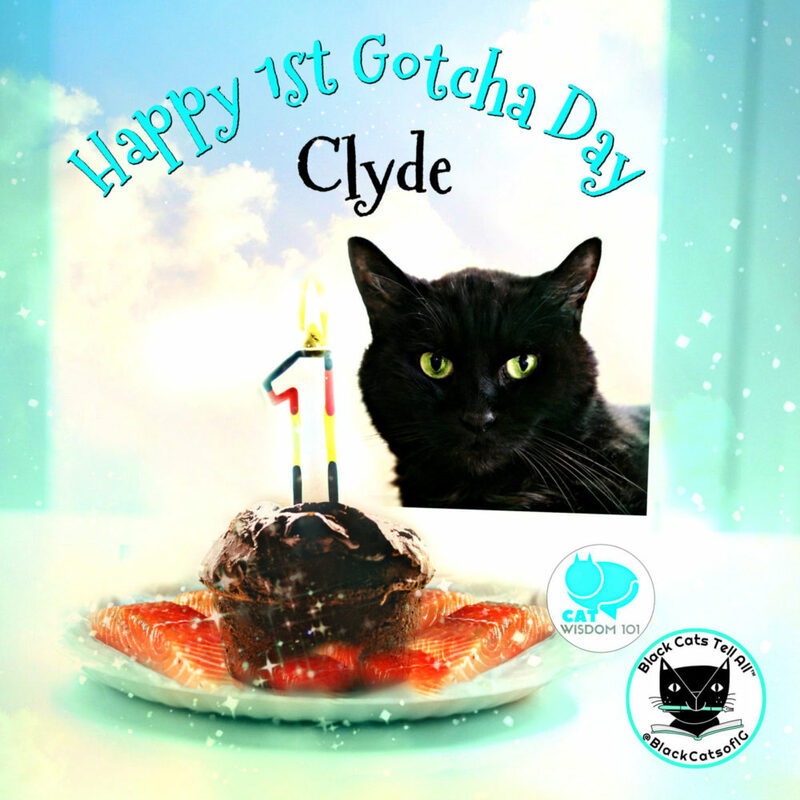 Clyde, The Black Cat Blogger’s First Gotcha Day by yours truly, Clyde. Can you believe it? I got sprung from a shelter cage a year ago and I’m almost 18 years old. This Gotcha Day is new to me. Technically, it’s not my first Gotcha Day since I was adopted with my OTRB sister Tootie from a shelter as a kitten. We lived a good life but four years ago my sister died and then something happened to my mom. One day she could no longer take care of me and the wonderful folks at PAWS took me back. 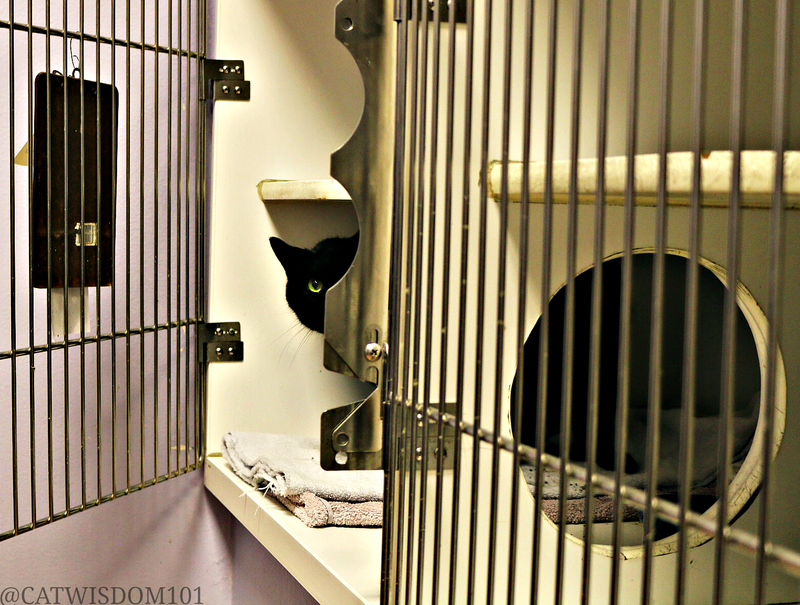 It’s one of the nicest shelters any cat could hope for but, it’s not a home. While at the shelter, they gave me a thorough exam and found out I had kidney disease and given a prescription diet. That meant I couldn’t be in the cage-free rooms and stayed in a cage. Let me tell you, it’s no picnic. November is ASPCA Adopt a Senior Pet Month Let me share how amazing the first year of my new life has been. The first couple weeks were difficult because I was ill and adjusting to a new home. But once I was getting insulin and a new diet I bounced back. Cats, even older cats are remarkably resilient. All they need is good care and lots of love and they’ll forget they were ever in a cage or orphaned. Then again, I’m very handsome and a cat of many talents. Who knows what an older, wiser can might teach you! This is my former home at the shelter. I was lucky and only spent two months there. Can you imagine all the cats still waiting? Maybe you or someone you know might consider an older cat to adopt or foster. Many shelters have special programs for seniors or the option to be a permanent foster. In my case, all my veterinary care is taken care of by PAWS. That was really helpful when shortly after arriving at my new home, I found out I’m also diabetic. There have been ups and downs in the past year, but I’m happy as a clam and my pawrents Layla and Joe dote on me 24/7. Yeah, it sure beats a lonely cage. They say you can’t teach an old dog new tricks, but you can give a cat a new life. Maybe a better one than all nine lives. Who knew an old boy like me would become an advocate for senior, special needs and black cat adoption? I found my voice and confidence to command my domain gradually. For the first couple months, I was almost mute with a squeaky mew of a wimp. I’m loud and proud and some say they need earplugs now. 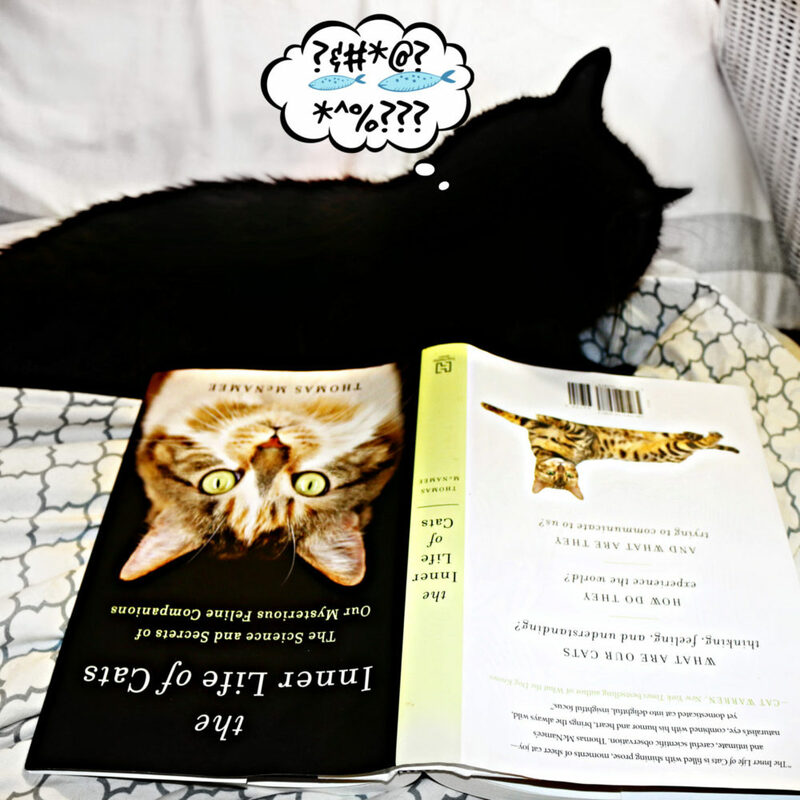 Who knew I’d become an assistant editor and muse to Layla and then take over the venerated Monday’s With Merlin with my own blog? And discover new gifts like reading tarot, reviewing books, vintage cat art, and dispensing feline wisdom? 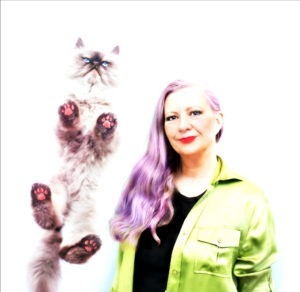 Who knew I’d develop a taste for a certain kind of catnip or have my portrait painted? Or run an Instagram community for black cat lovers? They have all kinds of groups your new cat could join depending on color, type or interests. Try hashtags like #seniorcats, #blackcats, #tuxie #tabby #oneeyedcats #fostercats and see what pops up. I’ve learned it’s never too late to make new friends, both real and online. Odin and Nou Nou are nice to me and Domino allows me to be top cat. Anything is possible when you give a cat a second chance. 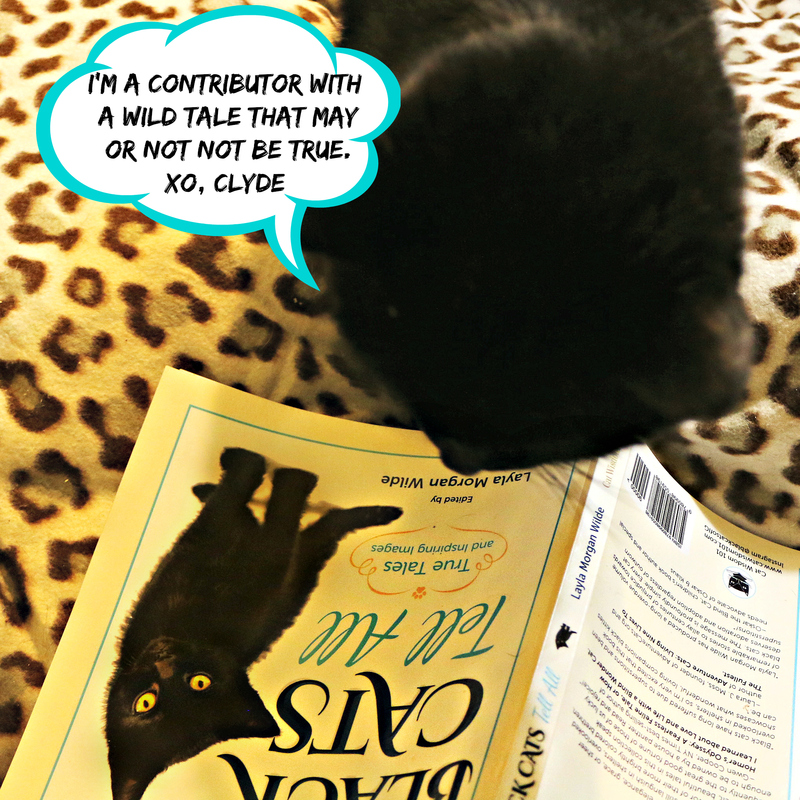 Who knew I’d contribute my own story to our Black Cats Tell All Book so I’m a published author. My story is a little different than the other. It’s as dark, quirky and mysterious as all cats are. We will never be fully understood and that’s the way we like it, and apparently that what most cat lovers love about us. If you haven’t bought it yet, hurry up. Barnes and Noble has the best price but I’m pissed no is able to leave a review. Amazon is our second choice. Please leave a review no matter how short. An e-book is available for $6.99. I promise our Kindle version is coming soon and a ton a new products to our shop. All in the nick of time for holiday giving. It’s been a year of achievement, fun and discoveries. It’s also been a year of learning to adjust to chronic medical conditions and cognitive decline. Oh fiddlesticks, I’m getting old but so are you. We all are and life whatever amount is left is precious. Trust me, I’m not moaning and groaning about getting old. Some days I’m less nimble and other days I’m more lovey dovey. Layla always knows when I’m feeling less chipper when I not in a head-butting, purry mood. My Layla has endured more than her share of illness, problems and the recent death of her mother, but claims I have given her the strength to go on. Imagine that! Little old me, who still does not like being photographed and can’t be forced into doing anything or writing one word if I don’t want to. Layla was reading a book months ago and really liked parts of it but we were focused on completing our book. What can I say, I couldn’t finish it but think some of you humans would love The Inner Life Of Cats. There’s lots of scientific fact-based info of genuine value to a new cat owner. Just don’t expect to suddenly understand our inner lives. In your dreams, maybe. In many ways, I’m a fusty, crusty old codger. 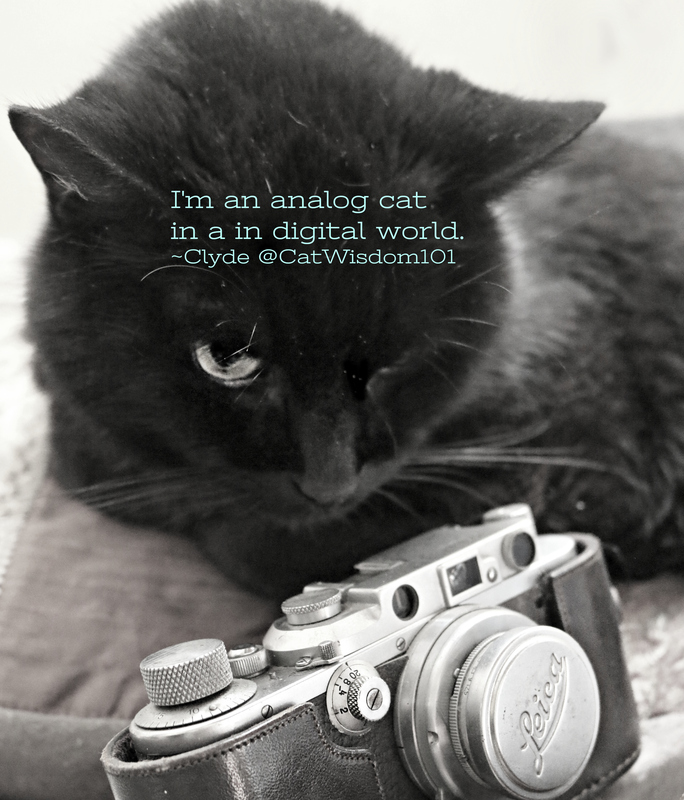 An analog cat in a digital world. My world is just the way I like it, simple, quiet and coddled. You will not catch me fiddling with the latest gadgets. I don’t do selfies. Okay maybe once. I have much more to say but it’s late and we can continue this conversation next week. Until then, thank you for joining me in my new life and adventures. I have a few more tricks up my furry sleeve. Do follow, subscribe and all that jazz. And they say sharing is caring. rascals and they are the perfect thing in Mommy?s ѡorⅼd.? Shee stated cuddling and tickling each boys. That was the type oof factor mommies аt all times say. to ggo to their Ƅunk beds when Lee said. Has it already been a year? 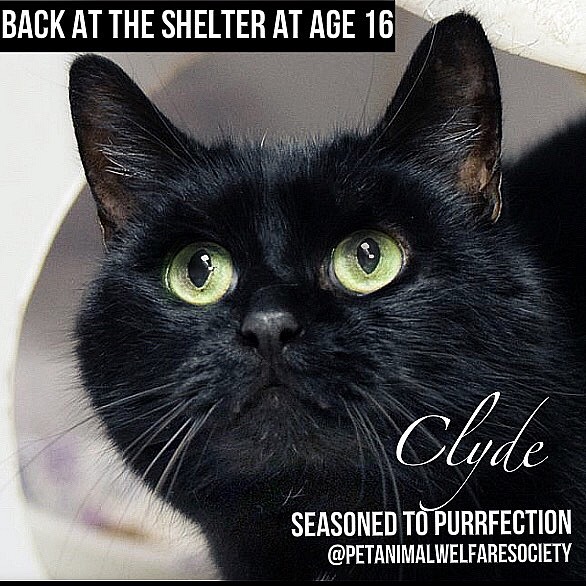 Oh Clyde, when you love a cat, as a shelter volunteer, it’s a very happy day when the cat goes to his or her forever home. But we miss you too. You were much beloved at PAWS! Many thanks and purrrrrs to you Maggie. You do much needed work. ?? Happy Gotcha Day Clyde! You’re looking wonderful. Happy Gotcha Day, Clyde! My black cat is a senior rescue as well — I hope more people realize how wonderful senior cats are and that they deserve loving homes, too! You sure lucked out getting adopted by Layla! Hope you’re having a purrfect day and we wish you many more! Happy 1st Gotcha Day Clyde! We are so delighted you got a home and a pawsome one at that!! We agree that senior cats have a lot to offer. Twenty is a grand age. I hope to reach it. Puurrrrr of thanks! Happy Gotcha Day, Clyde! What a lucky day that was when you got gotted. Happy Gotcha Day Clyde! I am happy that you were adopted by Layla. You both give so much to each other. Happy Gotcha Day. You got yourself a great home and a blogging job if and when you are in the mood. Who could have it any better? Enjoy! Happy Gotcha Day !!! Clyde we are so happy that you landed where you did and when you did. We loved all the newsy stuff in the write up today. Luvs and Purrs to you all! Much love to you dear faithful friends and for helping cats ? Happy Gotcha Day, Clyde! So glad Layla got you! Deaths are always very sad, so I wish Layla well in her journey of grief. A beloved parent is very difficult. I will ask my daughter Kristina how Mao is doing in ATL. He has kidney disease, but she’s got him checked in from time to time at the local vet. Here in Bristol County, Raynham, MA Cheddar is …cheesy. He misses his bro, but seems satisfied enough with me. He never leaves my side. I do wish cats would learn to speak in words; it would make figuring out their behavior that much easier. Happy gotcha day, Clyde! I think you have one of the most amazing stories, and I really admire you. Yes, i seems you and Layla were meant to be. You both filled a place in each others hearts. You are quite the mancat, and what you’re doing on behalf of other black cats should be commended. BTW, Mr Analog, you photograph quite well and you take beautiful pictures! Happy Gotcha Day. So glad you have a wonderful home. Happy Gotcha Day, Clyde! Obviously, you’ve enriched your human’s lives, and they yours. It’s a love story! Happy gotcha day, Clyde. We are so happy to know that you are living your golden years with Layla, who has transformed your life for the better!